Jeff Sauer served as a college coach for over three decades, won two national championships and ended his career near the top of college hockey's all-time wins list. He thought he'd seen it all as a mentor behind the bench until he received a call from USA Hockey three years ago asking him to consider coming out of retirement to coach the U.S. National Sled Hockey Team. "I kind of hesitated a little bit because I didn't know the players, didn't know what it was all about," Sauer told NHL.com. "But I'll tell you what. I was on the ice for 10 minutes and was hooked. The skill level is incredible and I'm in awe of what some of these guys can do. NBC and NBC Sports Network will provide eight hours of coverage of the 2014 Sochi Paralympics. The USA's matchup against Russia on March 11 will be aired at 3 p.m. ET on NBCSN. Additionally, NBCSN will provide live coverage of the semifinal round on March 13. The gold-medal game on March 15 will be aired at 1 p.m. ET on NBC. March 8 - USA vs. Italy 7:30 a.m.
March 9 - USA vs. South Korea 8:30 a.m.
March 11 - USA vs. Russia 8:30 a.m.
"It just rejuvenated me as a coach." That's saying a lot since Sauer's 31-year NCAA Division I college coaching career featured 655 wins and national championships at the University of Wisconsin in 1983 and 1990. He led the Badgers to three NCAA Men's Frozen Four appearances, 12 NCAA tournament berths, six Western Collegiate Hockey Association playoff titles and two WCHA regular-season crowns in 20 seasons (1982-2002). "To see many of the players I coached at Wisconsin move on and have productive careers in hockey is so rewarding to me," Sauer said. "Twenty years from now, I won't be around, but knowing I was able to do a little part in building the character of those I came into contact with over the course of time is something I won't forget." Sauer also spent 11 years (1971-82) as coach of the men's ice hockey team at his alma mater, Colorado College, where he was twice named WCHA Coach of the Year (1972, 1975). 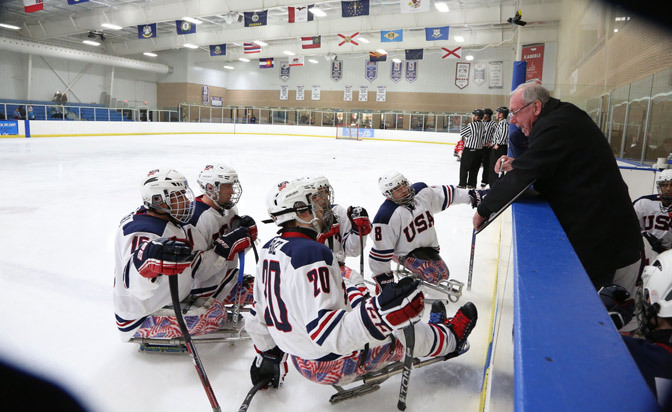 On Feb. 14, 2013, Sauer was named head coach of the 2014 U.S. Paralympic Sled Hockey Team that will compete in the 2014 Sochi Paralympics, which runs March 7-16 in Russia. The U.S., which won the gold medal at the 2010 Vancouver Paralymics, begins play March 8 against Italy at 7:30 a.m. ET. The semifinals are scheduled for March 13 and the gold-medal game will take place two days later. The U.S. defeated South Korea for the gold medal at the 2012 IPC World Championship, but settled for silver at the 2013 IPC World Championship after losing to Canada. All U.S. games will be streamed live at TeamUSA.org. NBC and NBC Sports Network will also have Paralympics coverage. "The first time I was around disabled people, I was intimidated," Sauer said. "I've worked with hearing-impaired kids and it's frustrating because you can't communicate with them. With the disabled athletes, you walk into the locker room and there's a leg hanging over there and two legs over here and you have guys getting from one side of the room to the other on the floor. The toughest part for these guys is getting to the ice. "But they are special athletes; not disabled athletes. That's how I treat them." That's what each player on the 17-member U.S. Paralympic Sled Hockey team appreciates. "He treats us like professionals and gives you the feeling that you're a hockey player and not disabled," first-year Paralympian and Buffalo native Paul Schaus said. "I think for a lot of the guys that adds extra motivation and gives you that drive to play even harder. I feel like I'm on a hockey team again, just like I was as a kid in high school." Sauer acknowledged teaching team concepts and reacting to situations on the ice is the key. "There are a few guys who are skilled, but my challenge is to teach them the game and teach them how to react to the situations, but that's also a fun job," Sauer said. "It's really a simple game and I don't do anything different with these players I wouldn't do with a college team. The only thing that is a bit frustrating is that they can't go backwards, so everything is a little bit geometry-based and angling when you're playing defense." His best offensive line is made up of U.S. war veterans Schaus, Rico Roman and Josh Sweeney. Sauer considers the trio to be extremely disciplined. "I call them the old guys; it's a 'yes, sir' situation," Sauer said. "When I tell them to go out and shut down an opposing line, they look at me and say, 'Yes, sir.' When I tell them to go out after we have been scored upon and provide some energy, they say, 'Yes, sir.' They are the most balanced and consistent line that I have; just a tremendous amount of discipline and attitude." Shaus, who served in the Marine Corps and is a Purple Heart recipient, had a bilateral above-knee amputation after being injured by an improvised explosive device in Afghanistan. "Paul didn't smile for the first six months that I knew him, I think because he was so down mentally from what happened to him," Sauer said. "Then, all of a sudden, he was a in a new sport and had an opportunity to open up. It's unbelievable how he's opened up and is now smiling all the time. "That's what makes this so fun for me." Roman is an Army veteran and Purple Heart recipient who had his left leg amputated above the knee after his vehicle was hit by an IED in Iraq. Sweeney, a former Marine sergeant, was injured by an IED in Afghanistan. "We're out there trying to make sure the other guys keep their heads up," Shaus said. "We're there to forecheck and grind it out. We all have that military mindset that we can relate to, so we're always on the same page." Sweeney, who centers the military line, agrees. "Our line is used to beating down [the opponent]," he said. Sauer was honored with the Lester Patrick Award in 2011 for his outstanding service to hockey in the United States. In 2000, he was recognized with USA Hockey's Distinguished Achievement Award and in 2004 the John "Snooks" Kelly Founders Award from the American Hockey Coaches Association for his contributions to the overall growth and development of the sport of ice hockey in the United States. "It was never about wins or losses for me," Sauer said. "It's always been about doing things the right way. The bottom line is I was able to get up in the morning and want to go to work, and not many can say that. And I've done it for over 40 years now."